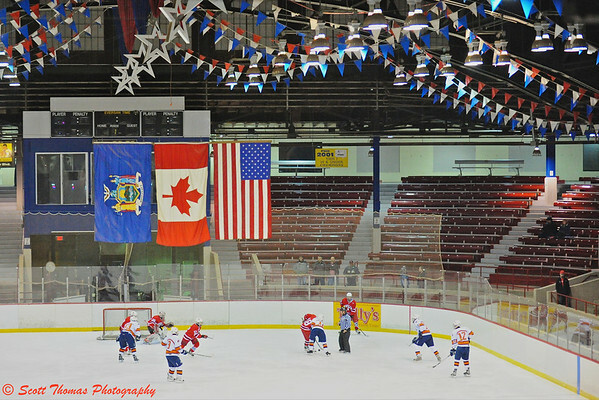 A high school ice hockey game being playing at the New York State Fairground’s Coliseum Sports arena in Syracuse, New York. Nikon D700/70-200VR, 1/500s, f/2.8, ISO 8000, EV +1.7, 95mm focal length. Specifically, my ice hockey history. Last Friday night I photographed a high school ice hockey game between the Baldwinsville Bees (my high school Alma Mater) and the Liverpool Warriors in the Coliseum arena at the New York State Fairgrounds. During the decade of the 1970’s, I played hundreds of hockey games and even more team practices on the Coliseum’s ice surface and the outside rink attached to the building. Players take to the ice before the start of a period inside the New York State Fairground's Coliseum in Syracuse, New York. Nikon D700/70-200VR, 1/500s, f/2.8, ISO 8000, EV +1.7, 75mm focal length. Try to imagine the feeling of nostalgia I got by being inside the Coliseum watching high school boys play a game I loved playing at their ages. The old barn, as we used to call it, no longer has broken glass windows and is decorated with red, white and blue flags and stars in the rafters. The flags hanging over center ice representing the State of New York, Canada and the United States of America are still there (though I am sure they are replacements of the ones I skated under some 40 years ago). The sounds, sights, smells and even the feel of the boards brought back memories of former coaches, teammates, opposing players and their parents. All bringing a smile to my face. Players and their coach watch the game action from the bench at the New York State Fairground's Coliseum in Syracuse, New York. Nikon D700/70-200VR, 1/500s, f/2.8, ISO 8000, EV +1.7, 200mm focal length. 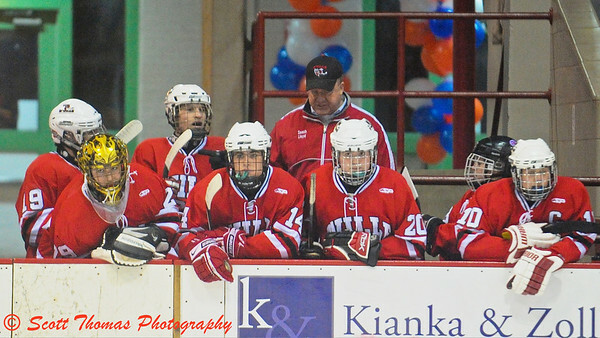 This entry was posted in Sports, Weekly View and tagged 70-200mm, baldwinsville, bees, coliseum, fairgrounds, high school, history, hockey, ice, liverpool, memories, new york, nikon D700, song, syracuse, the good old hockey game, video, vr, warriors. Bookmark the permalink. Sounds to me like you had a great time. I like the shot of the players heading out to the ice the best. Thanks, Tracy. 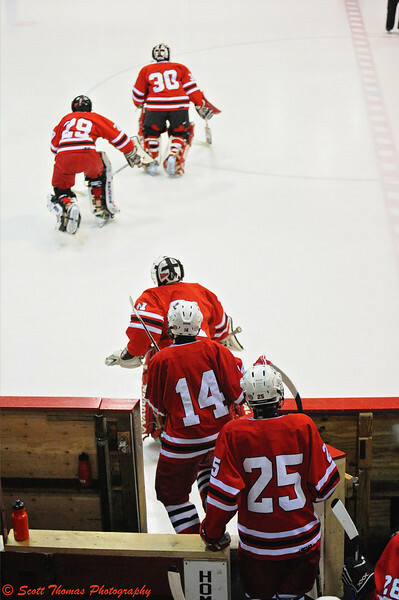 Hitting the ice like that is one of my favorite memories of playing. The anticipation before a game is intense. Wow, I didn’t realize that you played also, I’d say it’s equally as fun to photograph the game. I love the second image, all came out real sharp even with ISO 8000. Have I said how much I love my Nikon D700? These high ISO photos make shooting in these high school areas possible. Yep, I played and throughly enjoyed it. Now, I enjoy photographing the game almost as much.